You have few options for drawing connections between objects: Direct Connectors, Arc, Bezier, Smart and Curve Connectors. Direct Connectors are straight lines from the point of origin to the point of contact. Arc, Bezier and Curve connectors are drawn very similarly to Direct connectors. However, Smart connectors will automatically route around objects already placed in your drawing. Click the point you wish to originate the connector from and then drag your mouse to the desired end point and release the mouse button. Select the connector, and choose Line Color and Endpoints style from the Format panel. 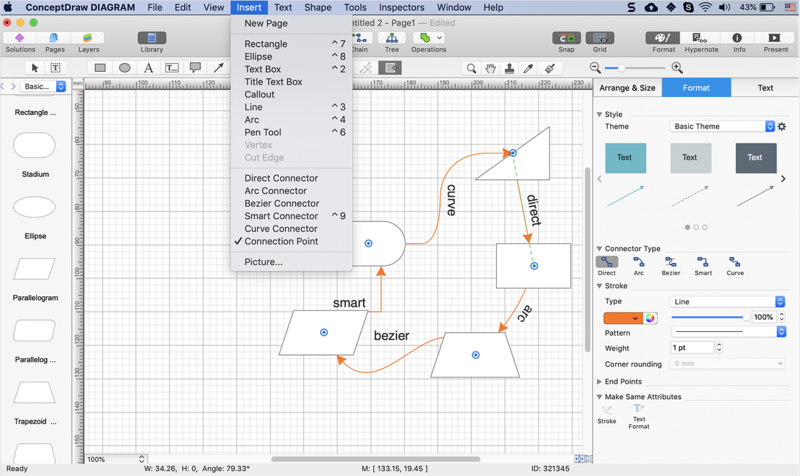 Result: You can connect objects in your ConceptDraw diagram with connectors and you can ascribe them different types and behaviors.